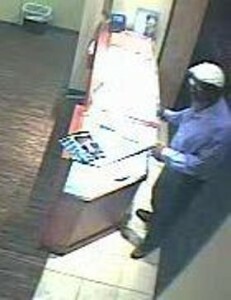 On June 19, 2015, at approximately 8:54 pm, a Felony Theft occurred at the Zales Jewelry Store located in the Killeen Mall. The suspect entered the store wanting to see bridal rings so the associate showed him a 4 CT TW bridal ring. The subject then asked to see another piece so the associate placed the first item back into the showcase and pulled out a second piece. The subject then stated that he wanted to see both pieces to compare side-by-side. The associate pulled the first piece out of the case. At this time, the suspect grabbed the merchandise from her hand and ran out of the store taking the two bridal rings valued at more than $13,000. 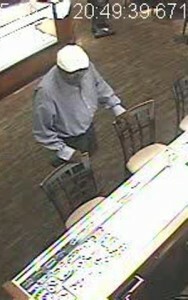 The suspect has been described as a black male with a salt and pepper mustache, in his mid 50’s to early 60’s. He stands approximately 6’0 and weighs approximately 220 pounds. He was last seen wearing a light blue button down shirt and an off white newsboy cap. Detectives are asking if anyone can identify this suspect or knows anything about this Theft, to contact Crime Stoppers at 254-526-TPS, go online anonymously at www.bellcountycrimestoppers.com or anonymously text BELLCO along with the tip to 274637. Text HELP to 274637 for help with the tip or text STOP to 274637 to stop the tip. All information is confidential and if your tip results in the arrest of the suspect responsible for this crime, you could be eligible for a reward up to $1,000 in cash.